The Sea Voice Beach House is the only rental property in downtown Rehoboth Beach, DE that offers PLENTY OF ROOM for your entire group without sacrificing comfort (11 bedrooms/10.5 bathrooms), the convenience of WALKING TO THE BEACH/BOARDWALK and downtown amenities (1/4 Block), AMPLE ONSITE PARKING so you won't have to fight for a parking space, and owners that are focused on providing you with a WELL MAINTAINED PROPERTY (we own a local construction company and are constantly making improvements). 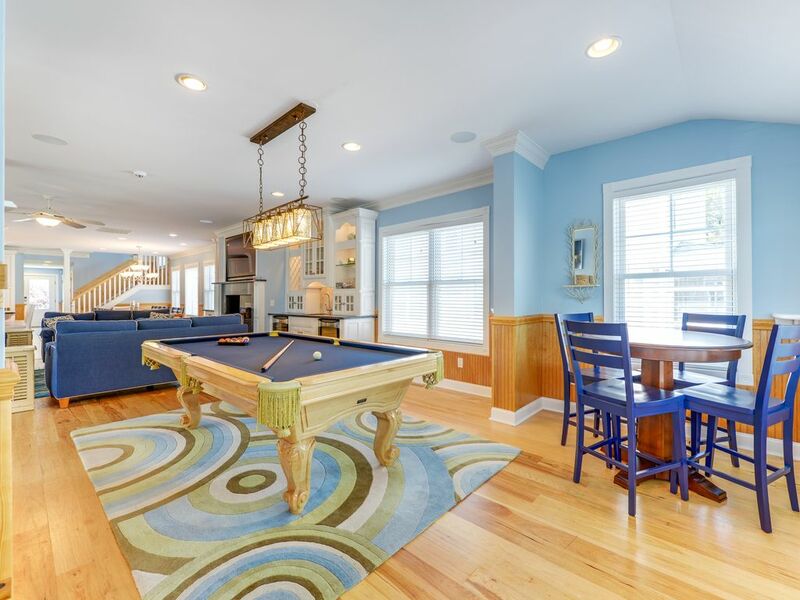 Just take a few minutes to review our photographs, customer reviews, and floor plans below to quickly understand why this has been THE MOST POPULAR RENTAL PROPERTY in downtown Rehoboth Beach, DE for the past 8 YEARS. Come see for yourself why several celebrities have chosen to host their family and friends at the Sea Voice. State-of-the-art appliances and home media equipment, coupled with a “classic coastal” atmosphere, results in a truly unique rental property. The following features and amenities are sure to make your Rehoboth adventure a memorable experience. • Living Space 4,302 sq. ft.
• Screened Porch 337 sq. ft.
• Rinnai tankless water heater on each floor (3) so you won't ever run out of hot water. • Comcast Xfinity wireless high-speed internet access (105 Mbps download speed - super fast). Strong coverage throughout the entire home. • 9 Parking Spaces (6 onsite and 3 street permits). All information contained herein is subject to further change or modification without prior notice. The primary reason for purchasing this property was for it's location. The Sea Voice sits 100 yrds from the beach and boardwalk in downtown Rehoboth Beach. A more desirable location for a family gathering, group retreat, or special event cannot be found. It you want to have the ultimate convenience of 9 parking spaces, room for 36 people, and never a reason to jump in the car, then the Sea Voice is perfect for you. The property is truly unmatched in services, features, comfort and location. You will be amazed when you walk in the front door for the first time. You'll have to travel great distances to find a comparable property. 1st floor bedroom offers 3' wide doorways, wheelchair friendly vanity, bathroom grab bars, and wheelchair ramp for access to home. The house was perfect for a large family. We had a fantastic week. Would definitely rent it again. We were a 19 person family reunion and really appreciated the number of bedrooms, bathrooms and the huge kitchen facilities. Also, so close to the beach that nap times could be spent at home with returns to the beach in the afternoon. We had a couple problems with the alarm system, kitchen electricity, etc. and were frustrated by the slow or lack of response from Tim. For the amount this house costs, it should have been in A++ condition or problems been instantly corrected. Thank you for sharing your thoughts on your experience at the Sea Voice. I'm happy to hear you appreciated the number of bedrooms/bathrooms and our kitchen facilities. I too was very frustrated with the alarm system which is why I've had it shut off until it can be fixed. Please accept my apology for not responding promptly as I happened to be on vacation with my family in a place with unreliable mobile service. Great house for a large group. My family really enjoyed our stay at Sea Voice.The location is great, especially for families with children- close to the beach,boardwalk,Funland, and downtown. The kitchen is well supplied and has two dishwashers, which is great for a large group. The whole living area is very nice and spacious. A beautiful home perfect for a large group! We have stayed twice- and would come back again! Great “family space”- well appointed kitchen- decorated with style but comfortable! The kitchen is by far the best thing about this house. We were able to prepare and serve 23 adults a Thanksgiving-style dinner with ease. The open island is huge and great for prep and layout. There are two dishwashers which make cycling through dirty dishes a breeze. There are 3.5 ovens! We could set each to a different temp without worrying about scheduling around the turkey. Parking was very flexible because it was the off-season and the beach is RIGHT there. We also liked that all of the gathering spaces are on one open floor. We had some trouble with the main tv remote. We tried to follow the manual but in the end, there was only one of us who was qualified to control the main TV. We also had some trouble with the coffee machine. We didn't realize until the second day that there was more than one and the pieces had been swapped. But this house has two of everything! Except hand soap - remember to bring your own hand soap and hand towels for upstairs bathrooms!